Pojar, Jim and Andy MacKinnon (editors). 1994. 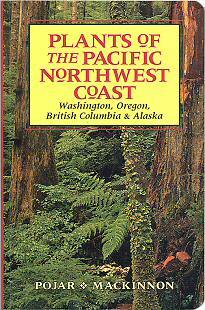 Plants of the Pacific Northwest Coast. Lone Pine Publishing, Vancouver and Edmonton, Canada, and Renton, Washington. Paperback. 527 pgs. A quality field guide notable for excellent color photographs, line drawings, and extensive ethnobotanical information culled from many sources describing plant uses by Aboriginal people of the area. The guide covers all major land plant groups of the region ( Pacific coast from Oregon to southcentral Alaska) including trees, shrubs, wildflowers (by family), lichens, ferns, mosses, and liverworts. An excellent and informative guide that goes well beyond simple identification.